On most days, chaplain Mark Ford works for the Prayer forces of is good, counseling drug and alcohol de addicts cheap jerseys at the Atlantic City Rescue Mission, a nonprofit Christian social-service organization. But late on wholesale jerseys China a Friday this summer, Ford became cheap jerseys China “Pope Frig’emall,” Relationship a chaos-worshipping cartoon priest bent on bringing evil incarnate to his world. Feature on LARP for the Philly Inquirer that includes some audio and few cheap nba jerseys characters who may appear in the book. 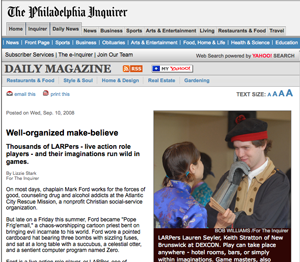 This entry was posted in Blog, Clips, Larp and tagged DEXCON, Double Exposure, Larp, Lizzie Stark, Philadelphia Inquirer, The Avatar System by Lizzie Stark. Bookmark the permalink.